Description: Jessie's shiba dog needs you to take care of her. First you'll have to clean her, brush her and then give Jessie some doggie-treats to feed her. 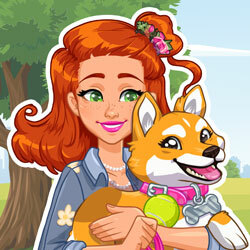 They are going to enjoy the day in the park and they need to look fabulous, so let's play some dress-up with Jessie and her adorable puppy!